Discussion in 'Community Projects' started by darthmorf, Jul 1, 2017. Welcome one and all, to a very special issue of the Creation Compendium - #50! To celebrate, we have hand picked our favourite issues from all 49 previous issues for you to look over, and perhaps feel a bit of nostalgia. We hope you enjoy! Sadly, it wasn't possible for us to pick every one of the amazing entries, so feel free to share your own favourites below. (Make sure to credit the creator!). 2) All entries must be Terraria related in some way or another, whether that is ingame, art, music literature or any other form of creativity. 3) Plagiarism is strictly not tolerated. Any evidence of such matters should be sent to a member of staff privately as soon as possible. The CC operates on a 'two strikes and you're out' system; after two offenses a user will be permanently banned from entering into all future Creation Compendiums. 4) The CC is a showcase, not a contest. All entries submitted (that are within the rules) will make it into the post. I'd also like to thank @Khaios for the sweet celebration themed logo and divider he made for us! Sadly there are only two entries from the first CC that are still working. This is our favourite - it shows off Terraria's humble beginnings. A humongous jungle base, complete with floating biome orb, underground space invaders and a buried temple. This is by far the most detail CC entry yet. The time it would have taken to screenshot this alone is staggering! The coloured lighting adds a very appealing aspect to this otherwise minimalistic build. Coupled with the symmetry, this is build is very pleasant to the eye. A nice rendition of the hottest member of the twins - Spazmatism. Simple yet elegant, and captures the details well! Although zoomed out quite far, this build contains an intricate pattern in addition to an interesting colour scheme. A shame there's no close up version! An angry looking purple dragon, standing on an arch of bones. Scary stuff! Let's hope that player standing in his mouth survives. A fearsome looking golem - just look at the anger in his eyes. You probably should have left him dormant in the temple! This build has a nice, ruined aesthetic, something not really seen in the CC before this. The flowing water adds a nice touch; a contrast to the green and brown dominating the build. A funny parody of the film and TV series Ghostbusters, this pixel art is certainly unique. But it begs the question, When there's something slimy, in the neighbourhood, who you gonna call? A relaxing snooze on a floating island, watching the sun set. What more could you want? The first ever speedbuild entry - a nice simple ice fountain. Sometimes you don't need complexity to create something beautiful. A stunning 3D rendering of an Eater of Souls. These would be truly terrifying in real life! Welcome to TCF - CC#19 was the first to be posted on this brand new site. Dispersion sets the bar high with his extremely creepy art of the Spooky Wood set - I would not like to bump into this guy on a dark night. A very interesting concept for this build - a Ying-Yang representing the relationship between the Hallow and the Corruption. Micro-biomes like this are always very interesting! This entry is something very special - one of the first appearances of Hoiks - now a staple in the Terraria Mechanical Engineering Corps. A great informative flowchart illustrating what to do with picked up items. I think even the most seasoned Terraria player can learn something here. 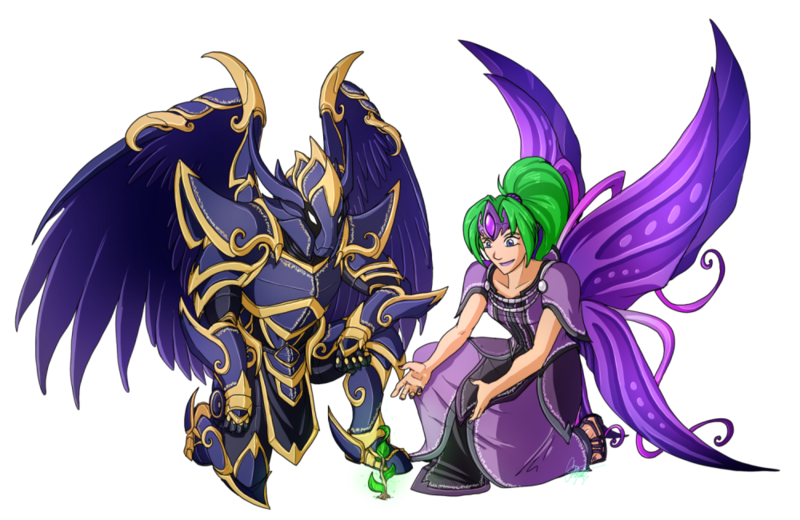 A lovely piece of art showing off Spectre armour, a Blizzard Staff and a Wisp. This mage is not to be trifled with! A stunning real life recreation of the Night's Edge sword. There isn't much for me to say apart from the fact that it's awesome. Check out her thread. Phew, we've made it half-way. To greet us is this great drawing by Ajidot showcasing an array of NPCs, including a particularly evil looking Goblin Tinkerer. Another display of some of the many NPCs in Terraria, this time in detailed pixel form. I wonder how Terraria would look in this sort of art style? Fresh off the 1.3 update, ppowersteef gives us a nice piece portraying three of the four Lunar Invasion armour sets. These players are about to kick some lunar- ! A mind-blowing 3D build in a 2D game. Curt's level of perspective is something stunning, and that combined with his attention to detail makes for an astounding entry. A lovely piece depicting a wisp, free from it's bottle. Personally, I'm a big fan of the lighting Scarecrow has created - the skull certainly looks as if it is aflame in some sort of dungeon fire. These two players look well equipped to face whatever Halloween can throw at them. Pumpking will be quaking in fear when he catches sight of these two. Nirvloyd has drawn some great representations of the major 1.3 weapons - they look truly awesome. Not only that, but the neat looking backgrounds and Moonlord-themed border make this a really unique entry. An extremely pretty 3D rendering of an underground mushroom biome. Strik3r has done a great job of capturing the atmosphere of these subterranean fungi. A lovely real life piece of art this time - a hand-stitched Plantera. The creativity of the Terraria Community never fails to astound me. Wow, another real life Plantera entry! This one is a great painting of our favourite plant-based boss. Normally she'd become enraged in the open air, but I don't think anyone could be when presented with such a lovely view. Following a similar theme, Elin la Verde presents us another terrifying mechanical boss. This time, The Twins! This animation really makes me feel how cool some sort of 3D Terraria game could be. Make it happen Re-Logic! On a more serious note, animation and 3D rendering takes a long time. Rya's done a great job. A cute little piece of art of a new player fighting The Eye of Cthulhu, backed up by a trusty slime minion. An admittedly slightly over prepared player in Solar Armoured fighting the Pumpkin Moon - I'm sure they'll be able to beat the Mourning Wood just fine! A great detailed pixelart of Redigit in his developer armour - pretty cool, and at this point I think it worthwhile to plug the Redigit IRL thread! A beautiful cherry tree with some amazing looking oriental buildings, bamboo, and even a hot spa pool! What more could you want? A Stunning in-game pixel art/build by Daria - if you only saw the map view you would have no idea that it was built within Terraria! A cool piece of art, combining both Plantera's name and visage. Daimera has provided something that stands up to her usual high standards! 'Genesis of the Sky' - a flying ship with a variety of rooms for every occasion. This mean machine is truly a scourge of the skies. A stunning animation displaying Tim the Sorcerer's true form. Thank god he doesn't have an attack that powerful in-game! An amazing real life drawing of the Terrablade. It's great to see different people's impressions of the weapons in more detail than exists within Terraria. Daimera's impression of the Wall of Flesh really puts into perspective how terrifying facing it would be. Let us hope that the voodoo doll was not dropped by accident! Unlike conventional tree-houses, this tree house is actually constructed from the tree! A great, complex build full of detail. Not to mention the more conventional house on the right. Thanks for reading through this extra special Creation Compendium - we've enjoyed sharing some history with you and look forward to many more issues in the future! Awesomesauce 9000, Endertron51, TheJoekster and 60 others like this. 50 Months active...that's over 4 years and counting! It's really amazing to see we're all still up to do it every month. It's really nice to see that you've made a highlight of all the Creation Compendiums so far, I would have almost suggested myself to do that. It's also a cool touch that almost every entry in the highlights was made by a different artist. showcasing how unique every artist is. Realith, AyeAye12, XSlayer300 and 15 others like this. It's really awesome that people can show their creations not only in threads but on the main page too! Good job everyone who participate in the Compendiums! Heretic, Daimera, DankySkeleton and 3 others like this. OneOnlyDan, Heretic, Gearzoid II and 6 others like this. It is an honour to help serve this community - I must agree that the entries this month were exceptional. DankySkeleton, Daimera, OriyonOrigins and 1 other person like this. LOL I made the 50th CC after all. Had something in the works for this -- but not enough time this month to finish it. Maybe for 51 or 52. OneOnlyDan, Heretic, DankySkeleton and 4 others like this. @Daimera's stuff almost always seems to win favorite in my book. Still loving Red's armor in her entry. Daimera, DankySkeleton, Exodus Starlit and 2 others like this. I was on the fence as to whether to create an account to show my creation (I wasn't quite confident on how it would turn out) but I'm glad I did. I really like how my entry turned out, and I look forward to sharing more creations in the future. Here's to the 50th Creation Compendium, and all of them to come! DankySkeleton, OriyonOrigins and darthmorf like this. Massive props to everyone for submitting an entry and pushing their limits! Never have I seen so many talented people come out simultaneously from any particular CC; this might possibly be the single greatest collaborative effort I have ever been a part of, and I am absolutely stoked to see what the future and this community brings. Awesome! 50 CCs, too bad I was too busy to put one in. BTW @ArmyFrog and @Terrathomas both have their names under the same entry (The picture is repeated). Is this at all intentional? I doubt it is. Good spot! I've fixed it now. Wow I made the compendium that's awesome! Really? I did not know that that's very cool! Wow! Getting to look back at a creation for each of the last 49 compendiums was such a treat, thank you for putting that all together for us. A lovely trip down memory lane. Really fantastic entries for this 50th issue. I really, really loved the drawn bows by c2Fk, and the adorable mini world by ChaoticFlame. The details of mini underground cabins, a corruption chasm complete with an ebonwood tree, and the one piece of honey block alerting that a hive is nearby are picture perfect. TheAssassin, DankySkeleton, OriyonOrigins and 1 other person like this. aldguton23, Xag, Heretic and 6 others like this. Daimera that artwork look absolutly amazing, I am kinda spechless. I really like how you did Cenx's and Redigit's dev sets. DankySkeleton, Daikonradish and ppowersteef like this. Everybody's occupied with the number 50 while I'm sitting here in a daze that somebody, @Loffy09, actually made Dark Matter.